This article will serve as a brief guide and overview of the Ichimoku Cloud technical indicator. While it will not be a comprehensive list of all things that are related to the Ichimoku, this article should serve as a solid guide that includes tips and hints about the Ichimoku (for crypto specifically), that are not typically included in other popular online guides. Above is a classic example overlay of the Ichimoku Cloud on a chart of Ethereum on the daily resolution, using TradingView as our charting resource. As a chartist, typically as soon as I get a shot to get a good view of the chart, I begin annotating it immediately. Annotations are what help me to collect my thoughts together, especially when I’m doing a price analysis. It seems tedious, but it really does help with getting ‘calls’ correct. One mistake that many individuals make when assessing the Ichimoku Cloud and its readings is that they tend to look at the original chart we posted above and then make an overarching conclusion such as, ‘Looks like $ETH is bearish and its hanging on the Senkou Span A as a support!’ with no further elaboration. 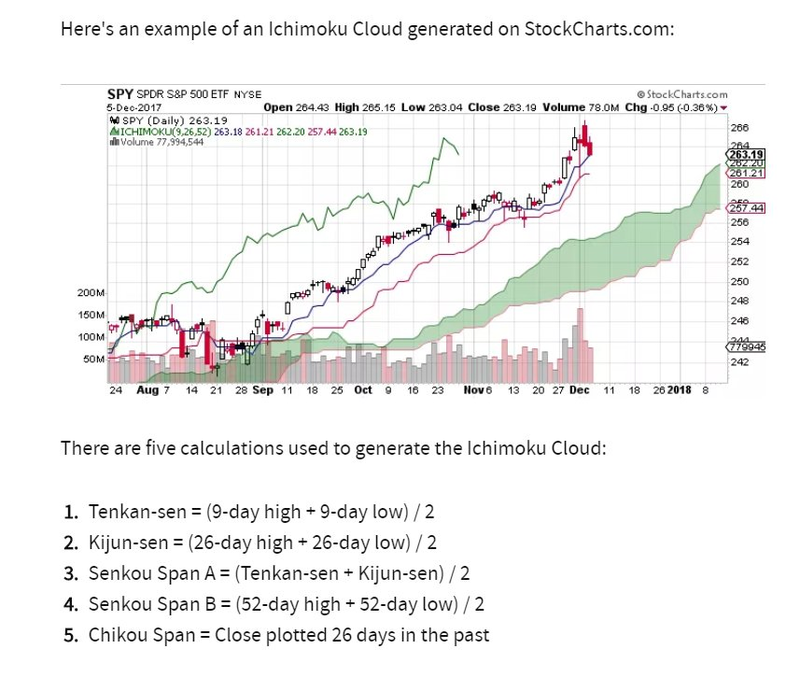 However, what we’re going to explain in this guide is that a proper analysis of the Ichimoku Cloud should contain considerably more information than that. 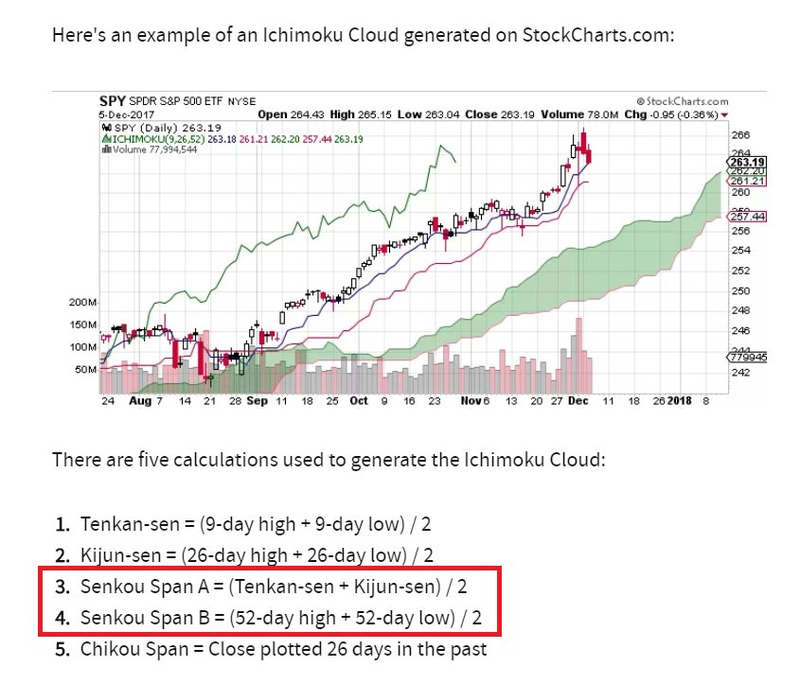 In order to seriously delve deeper into the Ichimoku Cloud and learn to extrapolate the best interpretation from the indicator’s readings, we must first have a thorough understanding of what the Ichimoku Cloud does. That lays in the formula for it as well as the construction of its lines. To simplify, the lines are all Moving Averages (if you took a look at the formulas you’ll see this). Specifically, as it relates to the Ichimoku Cloud, I believe that #3 on the list above is the most important by far. 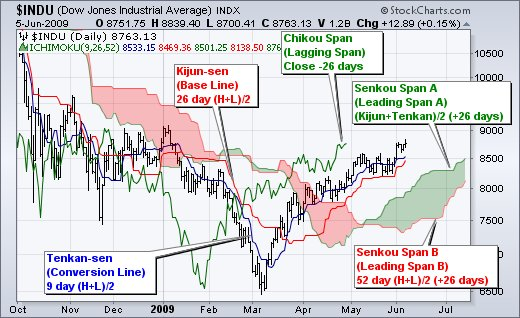 As you can see in the pictures above, the Senkou Span A + B are not only support+resistance points that form a cloud, they are also used as a ‘forecasting’ mechanism. Now, its important to understanding that when I say ‘forecast’, I do not literally mean that the purpose of this is to predict what the future price action is going to be. No. Instead, it is showing you what the price action would be if things continued their trajectory. If the price exceeds that forecast, then that’s bullish because we can extrapolate that the current price action is outperforming ‘expectations’ so to speak. The opposite is true if the price falls below the two Senkou Spans. That’s why its considered bullish if the price rises above the cloud & bearish if it descends below. Many have reached out to me personally to state that they believe the periods that I use on the Ichimoku are ‘incorrect’ or ‘inapplicable’ for crypto. This is actually not the case and I wrote a lengthy exposition for the members on Patreon about the Ichimoku indicator, how to trade it and in what situations it should be used. But to summarize, this is not the case at all. Essentially, the default periods for the Ichimoku were created to match an annual period for the stock market (52 weeks). Given the fact that crypto has no after hours trading, people feel that this is inapplicable or that it does not produce the best results. However, in this specific situation, I do think that the periods are a bit too large to draw an effective analysis of Ethereum’s future price movement on the daily resolution. This is because there was significant price movement 52 days ago (that puts us all the way back to November around the sell off point). Therefore, I want to ensure that this extra [outlier] data is not included in. We can see that the price action has failed to exceed any MA provided by the Ichimoku. Does this mean that the price will go down in the future? No. Not by itself at least. But it does tell us that there was a major decrease in price momentum. That’s the most important takeaway from this indicator. Entries/exits should never be made solely on the Ichimoku. But this information, in conjunction with information gleaned from other indicators, makes it a very potent asset for any trader.